Medicare is preparing to remove Social Security numbers (SSN) from Medicare cards. The Medicare Access and CHIP Reauthorization Act (MACRA) of 2015 requires CMS to remove SSNs from all Medicare cards by April 2019. In response, CMS has launched the Social Security Number Removal Initiative (SSNRI). When will the SSNRI begin? 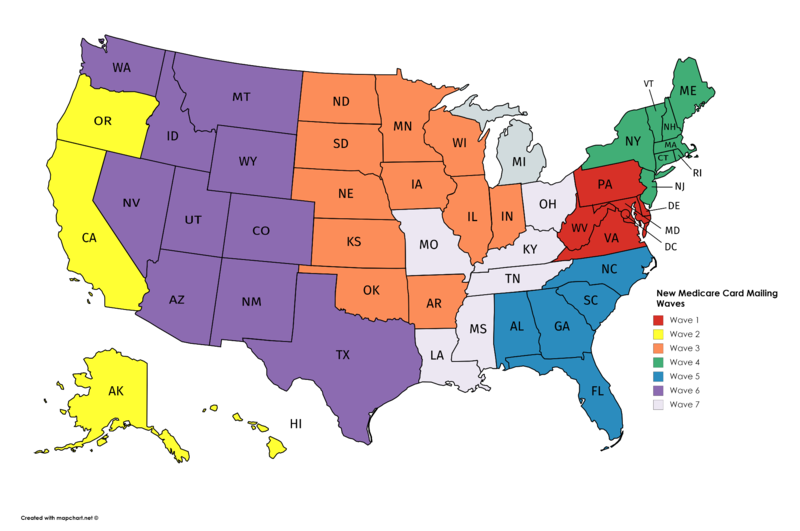 If the map shows the mailing is completed in your state, and your patient does not have a new card, they should call 1-800-MEDICARE (1-800-633-4227) to verify mailing address. In the meantime, a current Medicare card can be used for reporting healthcare services. The MBI number is randomly generated with "non-intelligent" characters that do not have any hidden or special meaning. The MBI's 2nd, 5th, 8th, and 9th characters will always be a letter. Characters 1, 4, 7, 10, and 11 will always be a number. The 3rd and 6th characters will be a letter or a number. A dash mark isn't used as part of the MBI. You should not enter them into computer systems and they won't be used in file formats. The new cards will no longer include a signature line, nor will they indicate the gender of the recipient. Like the SSN, the MBI is confidential and should be protected as Personally Identifiable Information. New Medicare cards may have a square code, also referred to as a QR code (a type of machine-readable code). The QR codes on Medicare cards allow the contractor who prints the cards to ensure the right card goes to the right person with Medicare or Railroad Retirement Board (RRB) benefits. Providers cannot use it for any other purpose. The RRB issued cards may have a QR code on the front of the card while all other Medicare patients may get a new card with a QR code on the back of the cards. These are legitimate (official) Medicare cards. Verify existing practice management and claims billing software can accept the new formatting. Use the Medicare Beneficiary Identifier or MBI format specifications if you currently have edits on the current Health Insurance Claim Number (HICN). Identify your patients who qualify for Medicare under the Railroad Retirement Board (RRB). You will no longer be able to distinguish RRB patients by the number on the new Medicare card. You will be able to identify them by the RRB logo on their card. Update your practice management system's patient numbers to automatically accept the new Medicare number or MBI from the remittance advice (835) transaction. Beginning in October 2018, through the transition period, CMS will return your patient's MBI on every electronic remittance advice for claims you submit with a valid and active HICN. It will be in the same place you currently get the "changed HICN": 835 Loop 2100, Segment NM1 (Corrected Patient/Insured Name), Field NM109 (Identification Code). CMS will begin accepting the MBI after April 2018. Remittance Advices will include the MBI after October 2018. Statutory deadline for issuing new Medicare cards is April 16, 2019. The MBI must be reported starting January 2020. Will there be testing for systems that use the MBI? CMS is planning to test internal systems that will use the MBI, including enhanced integration testing (EIT) for new or high-risk systems. The Agency is not offering end-to-end testing with Medicare fee-for-service claims processing systems because either HICNs or MBIs may be used to submit claims during the transition period. CMS has defined a specific time period where providers can report either the HICN or the MBI on claims. The transition period will begin no earlier than April 1, 2018 and run through December 31, 2019. During the transition period, CMS will monitor the use of HICNs and MBIs to see how many providers are ready to use only MBIs. They will also actively monitor the transition and adjustment to the new MBIs to make sure of their wide-spread adoption so Medicare operations aren't interrupted. No matter what the date of service, starting January 1, 2020, you must submit claims using the MBI. There are a few exceptions when you can use either the HICN or MBI. Appeals - You can use either the HICN or the MBI for claims appeals and related forms. Adjustments - You can use the HICN indefinitely for some systems (Drug Data Processing, Risk Adjustment Processing, and Encounter Data) and for all records, not just adjustments. Span-date claims - You can use the HICN for 11X-Inpatient Hospital, 32X-Home Health, and 41X-Religious Non-Medical Health Care Institution claims if the "From Date" is before the end of the transition period (12/31/2019). You can submit claims received between April 1, 2018 and December 31, 2019 using the HICN or the MBI. If a patient starts getting services in an inpatient hospital, home health, or religious non-medical health care institution before December 31, 2019, but stops getting those services after December 31, 2019, you may submit a claim using either the HICN or the MBI, even if you submit it after December 31, 2019. Home health claims & Requests for Anticipated Payments (RAPs) - You can use MBIs or HICNs on home health claims and RAPs with a from date before January 1, 2020. Because you submit home health claims for a 60-day payment episode, there may be times when an episode ends after the transition period on December 31, 2019. If the from date on the RAP or the final claim date is before December 31, 2019, you may submit either the HICN or the MBI. But, you must submit the MBI for RAPs and final claims when the from date is on or after January 1, 2020. What about Railroad Medicare Claims? You will no longer be able to distinguish people with Railroad Medicare by the number on the card. The RRB will continue to send cards with the RRB logo to people with Railroad Medicare. CMS will return a message on the eligibility transaction response for a Railroad Medicare patient. The message will say, "Railroad Retirement Medicare Beneficiary" in 271 Loop 2110C, Segment MSG. If you use eligibility service vendors to check patient Medicare eligibility, contact them to find out how to get this and other information. What does the SSNRI mean for people with Medicare? The switch to MBI won't change Medicare benefits. People with Medicare may start using their new Medicare cards and MBIs as soon as they get them. Where can I get more information about the SSNRI?